Diron wholesale cat aftermarket piston ring and sale replace piston ring used for heavy equipment cat, cummins, komatsu. We are heavy equipment replacement parts piston ring dealer from china. Piston Ring is used to embed the inner ring of the metal ring, the piston ring is divided into two types: compression ring and oil ring. The compression ring can be used to seal the combustible mixture in the combustion chamber; the oil ring is used to scrape off the excess oil on the cylinder. 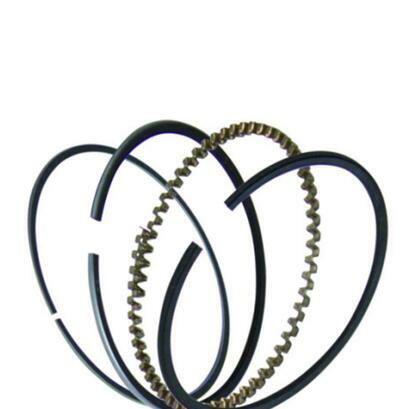 The piston ring is a metal elastic ring with large outward expansion deformation, which is fitted into the corresponding annular groove of the profile. The piston ring is the core part of the fuel engine, which together with the cylinder, piston, cylinder wall, etc. to complete the fuel gas seal. Commonly used car engine has two kinds of diesel and gasoline engine. Because of its different fuel performance and use of the piston ring, the early piston ring was made by casting formation. But with the progress of technology, a variety of advanced surface treatment applications which continue to improve such as thermal spraying, plating, chrome, gas nitriding, physical deposition, surface coating, zinc manganese phosphate treatment, So that the function of the piston ring greatly improved.